Ferrari had been fastest all through the practice sessions and the first two rounds of qualifying. But then along came the rain in Qualifying 3, ruining Ferrari's reign. 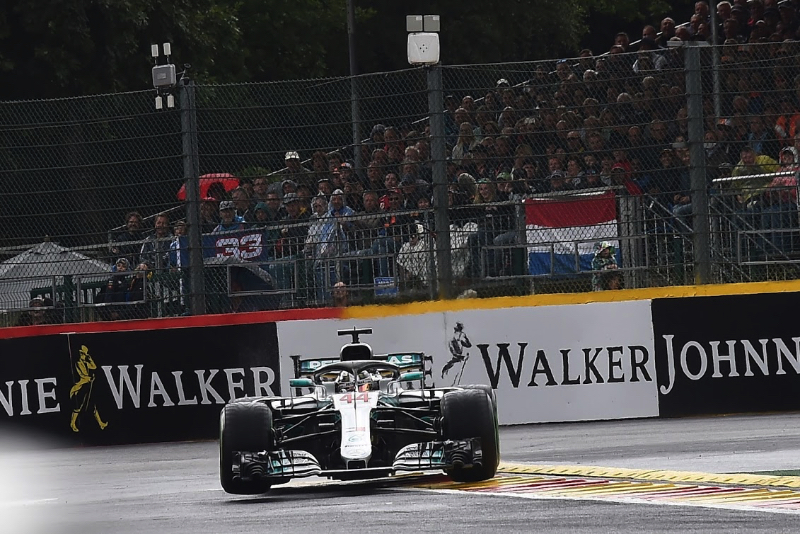 Lewis Hamilton sped through to grab the pole in his Mercedes to head what would be an eclectic top 10 starting positions for the Belgian Grand Prix. The line-up for the weekend was: Mercedes - Hamilton and Valtteri Bottas; Ferrari - Sebastian Vettel and Kimi Raikkonen; Red Bull TAG Heuer - Daniel Ricciardo and Max Verstappen; Racing Point Force India Mercedes - Sergio Perez and Esteban Ocon; Williams Mercedes -Lance Stroll and Sergey Sirotkin; Renault - Nico Hulkenberg and Carlos Sainz; Toro Rosso Honda - Brendon Hartley and Pierre Gasly; Haas Ferrari - Romain Grosjean and Kevin Magnussen; McLaren Renault - Fernando Alonso and Stoffel Vandoorne; Sauber Ferrari - Marcus Ericsson and Charles Leclerc. Vettel was quickest in FP3, turning a 1:42.661 on Pirelli's super soft tires. Hulkenberg and Bottas would be starting the race from the back of the grid because they had new power units. The ambient temperature at the start of qualifying was 59 degrees Fahrenheit (15 degrees Centigrade) and the track temperature was 84 degrees Fahrenheit (29 degrees Centigrade). There was a 90 percent chance of rain. Raikkonen got up to speed with a time of 1:42.595 on the soft tires. Hamilton grabbed second ahead of Vettel and Verstappen. The important times, of course, were down at the bubble cut off. Halfway through Q1, Ericsson was 15th with Alonso 16th and Hartley 14th. Bottas had not bothered to go out given his looming penalty. Ricciardo was a distant but still safe tenth with four minutes to go. With three minutes remaining, Bottas finally emerged. Using the super soft Pirellis he jumped up to second. There was plenty of action in the closing moments. The five drivers who were eliminated at the end of Q1 were: Sainz, Alonso, Sirotkin, Stroll and Vandoorne. The fastest 15 drivers who moved on to Q2 were: Raikkonen, Bottas, Hamilton, Vettel, Verstappen, Grosjean, Ricciardo, Leclerc, Magnussen, Ericsson, Ocon, Perez, Hulkenberg, Hartley and Gasly. The keen Raikkonen was first out in the 15-minute session. Hulkenberg would bother to take part in Q2. Using the soft tires to set your best time in Q2 would mean they would also be used for the start of the race rather than the less durable but faster super soft compound Pirellis. But the top drivers were on the super softs at the start of Q2. Raikkonen turned a 1:41.627, a new qualifying record. Once again, Hamilton and Vettel could not match the fast Finn. And Verstappen was again ahead of Ricciardo. Further down in the order, Gasly was tenth and on the bubble with Hartley 11th and Ocon ninth after the first run of laps. After a visit to the pits, most of the drivers came out for another go in the final two minutes. Vettel went fastest with a 1:41.501, beating Raikkonen by 0.032 of second and Hamilton by 0.052 of a second. The five drivers who were eliminated at the end of Q2 were: Gasly, Hartley, Leclerc, Ericsson and Hulkenberg. The fastest 10 drivers who moved on to Q3 were: Vettel, Raikkonen, Hamilton, Bottas, Verstappen, Perez, Grosjean, Ocon and Magnussen. It started to rain during the short break between Q2 and Q3. But the rain soon stopped so the track was dry when the 12-minute session began. But the drivers rushed out as soon as the green lights went on so as to get in a time before the rain returned. Moments later it began to rain on some parts of the track. Bottas had a spin. And almost all the drivers save Ocon and Perez pitted for intermediate rain tires. Their gamble did not pay off. The rain increased. Verstappen set the first time, a 2:02.849. Five minutes remained as Raikkonen turned a 2:02.671. The rain eased. Vettel took the provisional pole with a 2:02.446. His next lap was even faster - 2:01.188. The track was drying. Hamilton slammed in a 1:58.179. Vettel got up to second. And Ocon and Perez were a fabulous third and fourth. Grosjean qualified fifth ahead of Raikkonen, Verstappen, Ricciardo, Magnussen and Bottas.